"In a world dominated by consumer choice, how strange so much is 'one size fits all'. In the world of jazz guitar, there is an overwhelming choice of variations of the same theme. The modern jazz guitar has evolved into a refined and ambitious instrument, but at the expense of its forebear's acoustic allure. I say 'expense' because only an acoustic guitar can convey all the subtle nuance and dynamics that emerge from the intimate interplay between player and instrument. When I saw Martin's guitars, I knew his thinking was closely aligned with mine and with a few tweaks to his design concepts to satisfy my foibles, I would at long last be able to merge more fully with my instrument. If worth is measured by its proximity to perfection, then inestimable worth might more precisely describe Martin's craftsmanship and innovativeness." “The Elfin and I had our first recording session today, doing rhythm tracks for the cast recording of Godspell. It was a total success. The orchestrator had written a lot of material below low E, so the B string got a work out, and to my delight, I was able to play naturally and have those low notes blend in perfectly with the "regular" range. That's something I've never been able to do with any five string in the past. This bass is so even. And responsive! I've got the action set really low, with almost no relief in the neck, and I can play with lightest right hand touch I can muster and notes just speak so easily. Very rewarding. There are so many thing I love about your basses. Tough to go into details on this. I fell in love with my first Elfin the moment I saw it. Then I played it and... That was it. I had a deposit on a new 5 String at a local shop. As the guy was getting it ready, I started noodling around on other basses in the shop. I picked up yours and that was it... I knew what I wanted to do. I'll take this guy. He was cool with it. So, that's how it started. Thanks Again, Martin. 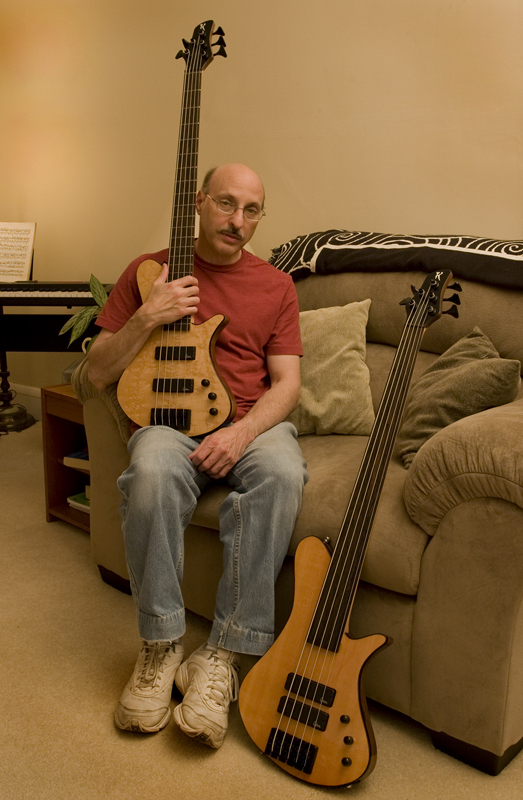 I bonded with the fretless as quickly as I bonded with the fretted. It's there. No doubt. I am so freaking happy with this bass. Thanks Again!!! Album “For Dreams” available on Amazon!